As individuals, businesses, city skylines and landmarks in 172 countries and territories switched off their lights to mark Earth Hour, marking a new record, Mount Lavinia Hotel became one of the organizations which represented Sri Lanka, observing Earth Hour for the 7th consecutive year. 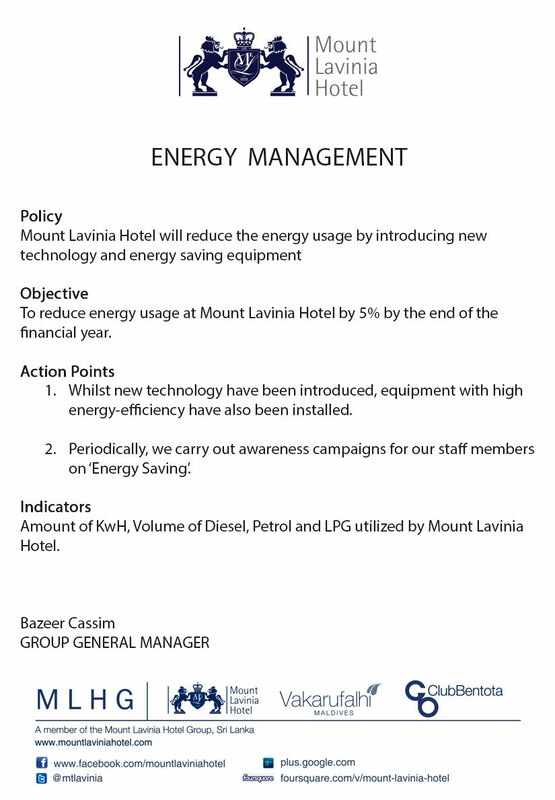 Mount Lavinia Hotel observed Earth Hour on 19th March by switching off all lights in the public areas, guest rooms and restaurants. A structure depicting the iconic 60 + was lightened with the participation of the hotel staff and guests. The patrons at the Governor’s Restaurants and Seafood Cove enjoyed dinner illuminated by candle light and lamps. Going beyond the boundaries of Mount Lavinia Hotel, this year’s Earth Hour observances reached out to the neighbourhood. The staff actively encouraged the neighbouring schools, shops and residences to participate in the Earth Hour by switching off the lights in their own houses or organizations. Through this outreach the Green Committee of MLH aims to go beyond the hour and encourage all stakeholders to work together towards cultivating a better living environment for our future. As the largest environmental event in history, Earth Hour asked people and communities around the world to switch off their lights for one hour as a silent but powerful statement about the effects of human-accelerated climate change. Last year, more than 5,200 cities and towns in 135 countries worldwide switched off their lights for Earth Hour, and thousands of individuals took advantage of the opportunity to go “Beyond The Hour” to change their energy consumption habits for good. MLH who have been active in their green initiatives have taken the Earth Hour celebrations which beyond the idea of it being a trend. “WE at MLH have celebrated it three years running and the only way Earth Hour can make a real difference is to recognize and celebrate the fact that this is the greatest time to be alive, and to illuminate global climate change,” stated MrAnuraDewapura, General Manager of MLH and the initiator of the Slow Food Chapter in Sri Lanka. “We went beyond the hour and made it an evening mixed with responsibility, sustainability and a celebration of nature in its purest form.” 30th Slow Food Night at MLH was held as a celebration to the significant hour of need and emphasized that it is more than just switching off the lights for an hour. Slow Food is the world’s largest single campaign in support of planet earth. The 30th Slow Food Dinner showed off with Chef Riccardo from Vakarufalhi doing the honours of presenting the menu by candlelight. All featured menu items were ingredients that are local and seasonal. This was a truly great event and an elegant way to spend Earth Hour. Campaigns- Planting of Trees, in the nearby areas with the group effort of neighbouring schools, such as The Girls High School Mount Lavinia and The Buddhist Girls School in Mount Lavinia. Kaduru Project- Kaduru seeds planted at the hotel nursery. Once the plant grows to a certain height they are used as decorations in the guest rooms and public areas. The cost of purchasing flowers from Nuwaraeliya will be a savings. This stops the carbon emission for hotel decorations. Once they grow higher they are removed and planted on river banks to conserve soil erosion. More than 60% of the staff working at The Mount Lavinia hotel is from the local community. Distributing trees free of charge to enhance the green initiative. . Slow food promotion gives the opportunity for local farmers to take part in these events and address guests directly. Monitor energy consumption daily with 2 main meters and 44 sub meters (monitoring 93% of total usage) The aim is to monitor 100% by end of the year. Fix timers and motion sensors for better controls in the Sea & Garden wing and the public areas. Fixed Variable speed drives on pumps. It reduced more than 1500Kw Per Day 547500Kw per annum. 8% of total usage (approximately). More VSD units to be fixed during this year. Room temperature set point was initially at 22 degrees Celsius presently, the room temperature set point maintained at 24 degrees Celsius. Fixed energy saving card switches to all guest rooms in the Sea and Garden wing. Setting upto extend the facility to other rooms. Sun light used for the corridors at the Bay wing and the old wing of the Hotel. Preventive maintenance is on time. This will stop unexpected break downs and save energy and spare parts cost. Conduct classes to team members on “How to save energy at their home”. The objective is to ensure they practice these lessons everywhere. Monitor, energy consumption daily with 2 main meters and 37 sub meters. Fix low flow rate filters to all taps. Fix low flow rate showers to all guest rooms. Dual flush systems installed in 81 guest rooms. Fix electronic sensor type valves for urinals. Reduce the water quantity by keeping object inside the WC flush tank. All guest rooms contain tent cards. 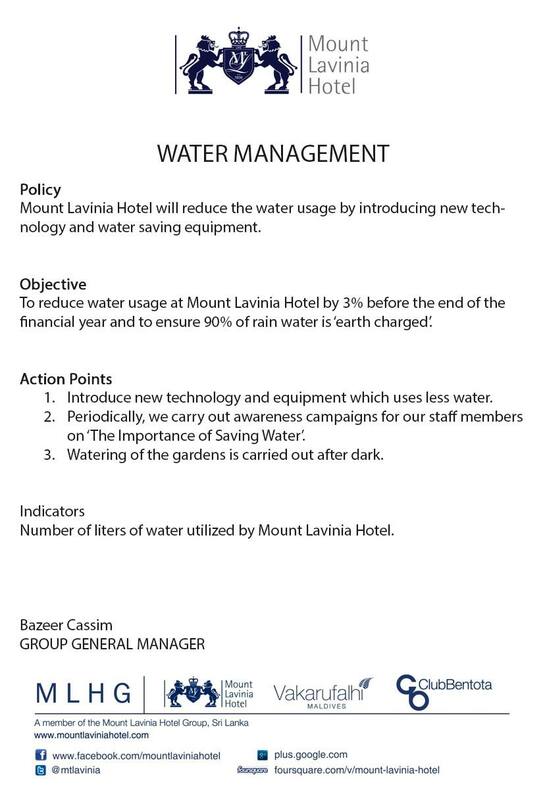 (For linen reuse as guest wishes) this programme will reduce the quantity of water, chemical and electricity. Collect all condense water from ice machines & A/c units then direct them to fountains. Environmentally responsible, sustainable or “green” procurement committee select products and services that minimize environmental impacts and maximize the 4Rs – reduce, recycle, reuse and recovery. If waste is produced, every effort should be made to reuse it. Recycling should only be considered for waste which cannot be reduced or reused. Recover materials or energy from waste which cannot be reduced, reused or recycled. Compost plant – garden refuse, outlet waste particularly organic are composted in our compound and used for all our gardens. Bio-degradable pesticides – We manufacture our own biocides by using left over soap from guest rooms and ‘kohomba’ (Margosa or Neem) oil; The oil has a medicinal value. It is used to make herbal oil. The speed is valuable as an insecticide too. The green leaves are insect resistant. We have obtained ‘Bio-degradable Certification’ in respect of all chemicals used in Laundry, Housekeeping, Food & Beverage and Kitchen. Instructions have been given to the general office staff on the re-use of box files, photocopy paper, used paper and old documents. Empty jam jars and glass bottles, laundry chemical cans, canisters and flagons are re-sold for re-filling. Polythene bottles, bags and papers are sold to recycling plant. Cardboard boxes and containers are re-sold to paper re-cycling plant. Cost saving mechanism – Bulk quantities are purchased as much as possible particularly on Kitchen and Food and Beverage supplies. Stores helpers and assistants have been trained in the proper use of equipment and chemicals. This is in order to obtain maximum benefit from equipment and chemicals. Change guest amenities to use bio-degradable and eco-friendly products. Re-cycled paper to be used in guest rooms. The use of plastic has been reduced. Wet garbage sent to live stock farm. 100% garden waste is compost. All paper waste separated from the place of origin is sent to paper plant for recycling. 90% of dry garbage is separated and plastics, glass, metal is sent for reuse and recycling. Coconut shells are sent to craft shops. Income from selling those items credited to Team member welfare fund. All internal communications on e-mails are subjected for printing if really necessary. Reusing programme on A4 papers in all offices. We purchase only cleaner products. Keep minimum stock on vegetables to reduce spoilage. 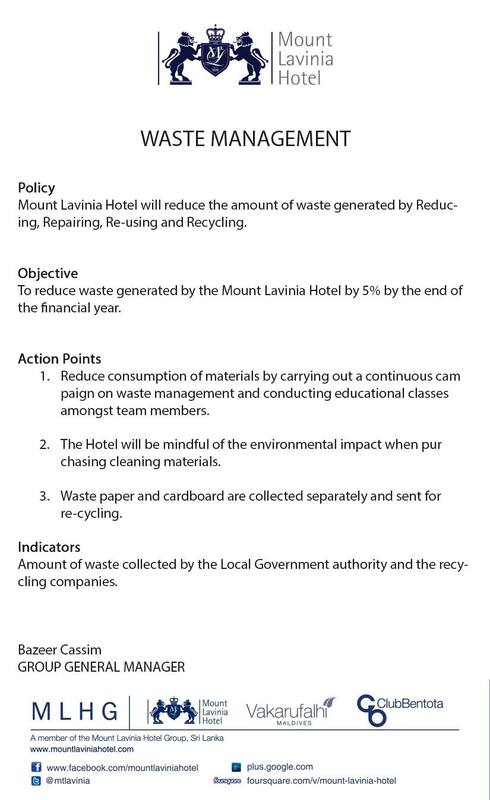 The Mount Lavinia hotel produces their own compost and does not purchase outside fertilizers. 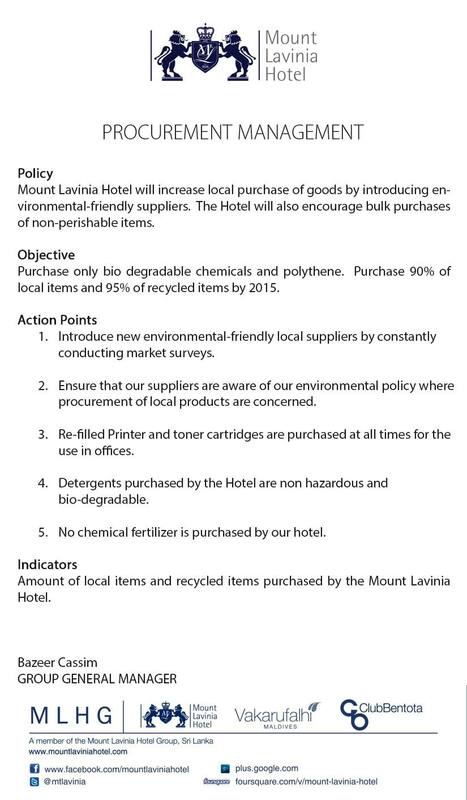 The Mount Lavinia Hotel does not purchase pesticides and use eco friendly products. We make required pesticides for the Hotel by using Kohomba seeds etc. Fruits for the welcome drink served at The Mount Lavinia Hotel are purchased from the local market and its seasonal. “Green Month is an opportunity for all Sri Lankans to take a positive and active role in helping protect our environment. By planting native trees and shrubs, we can help to combat climate change, provide food and shelter for our wildlife and beautify our surrounding,“ states MrAnuraDewapura, General Manager Mount Lavinia Hotel. 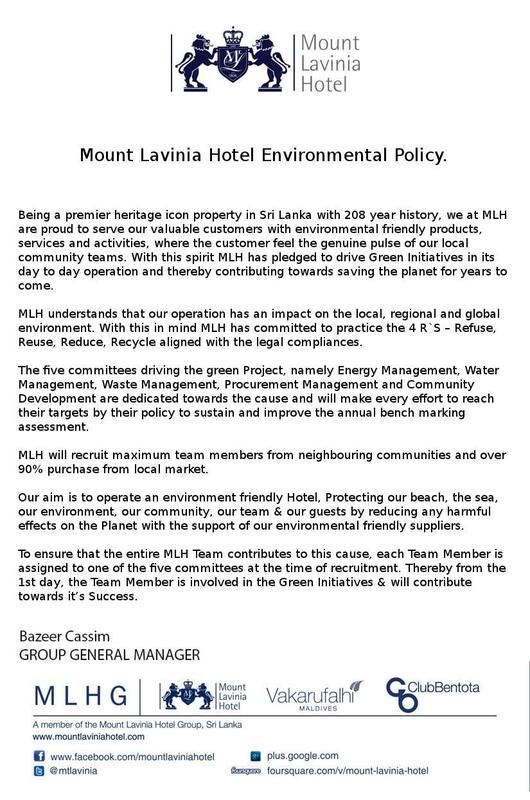 Mount Lavinia Hotel‘s commitment to the environment by undertaking five aspects that will be assessed towards Certification in the future, is right on schedule. The hotel will be assessed according to performance criteria that will guarantee, among other things, better waste management, less air pollution, noise control, energy and water consumption control. Celebrating the National Tree Planting Day along with NillaPiruna Ratak programme under the MahindaChintana at the Mount Lavinia Hotel is indeed a logical fit given to its ongoing “GOING GREEN” commitment to working for the environment. The main aim of the Green Month is to inspire, educate and recruit many to actively care for our unique land and create future generations of committed environmental custodians. And the objective behind Mount Lavinia Hotel’s initiative to plant coconut seedlings is to use species that are best suited to local conditions, since native plants use far less water than exotic species, in addition they help restore the natural character of an area, and finally they provide food and shelter for local native wildlife. Since December 3rd has been designated the Global “No Pesticides Use Day” to commemorate what many consider the worst chemical disaster in the history of humankind–Bhopal. The date was chosen to commemorate the anniversary of the chemical disaster in Bhopal, India, which occurred 3 December, 1984, and killed hundreds and injured thousands of people. And indeed the day aims to draw attention to the life threatening impacts of chemical pesticides on people and the environment. 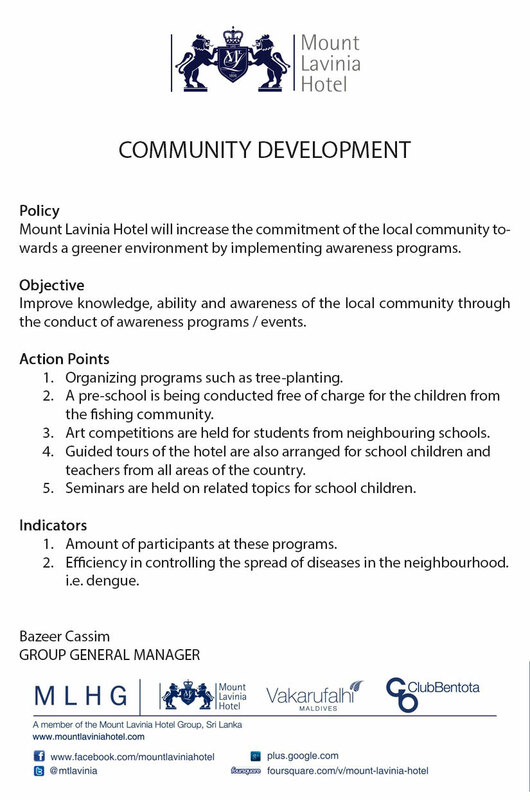 Mount Lavinia Hotel’s Green initiatives main mission is to offer tangible ideas to be actively shaping the environment that they live in, and commemorating a day as such is one of their pledges to a better tomorrow. To commemorate the day Mount Lavinia Hotel launched their compost manufacturing unit in the property along with the afternoon spent in using biocides on plants which replaces harmful pesticides, weedicides and fungicides in the premises and environment of the property.